If you know Mary Ott, you know that attention to detail, pattern and organization are three of her strong suits. This was true when she was a youngster, too. Science and math were significant ingredients in her "recipe" of life. Added to that were a little pinch of violin, the freedom to roam the fields just outside her Cleveland, Ohio suburban home and stirring companionship of one brother and two sisters. During graduate studies at the University of Chicago she obtained a masters in physics and a doctorate in curriculum and philosophy of education. To balance out all that left brain thinking, Mary nourished a fledgling interest in the visual arts by slipping from time to time into the Art Institute of Chicago. Her career included research in condensed matter physics at John Carroll University, developing a physics course for engineers at Cornell University, and research in higher education at the University of Maryland. In the late 1980's when she attended a Montgomery County Recreation Department painting class with her young son, she developed an interest in creating art and hasn't looked back since. Studies with Peggy Parker, Ann Marchand, and Susan Goldman opened up the world of art for Mary. Further inspired by Bonnard and Wolf Kahn, she explored painting for several years before taking printmaking classes at the Corcoran College of Art and Design: etching, lithography, monotype, screen printing. Now printmaking is her favorite medium, and the precision she developed in the science lab serves her well in the printmaking studio. After traveling abroad doing genealogical research, she made a series of intricate intaglios of European buildings. 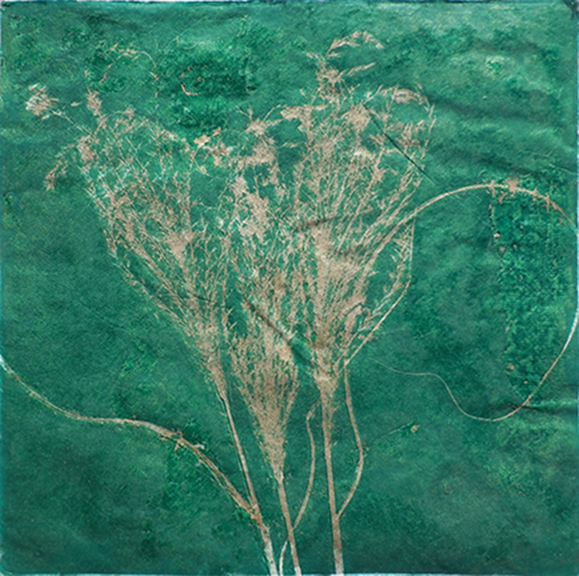 But her most recent work focuses on monotypes, one-of-a-kind hand-pulled prints of the natural grasses that she loved as a child and continues to grow in her garden today. Dried ornamental grass is used either to print an image of the actual grass using etching ink, or to block out the ink and maintain a white area on a colored field. Rhythmic grass forms capture her attention to details and patterns, while strong vibrant colors accentuate the positive/negative composition. Printing on Lokta, Kochi and Bhutanese papers also contributes to the fun of seeing how each color is absorbed on the press bed. All in all, the images in this series remind me of Japanese Wabi Sabi, an aesthetic that includes asymmetry, irregularity, simplicity, austerity, intimacy and appreciation of the integrity of natural objects and processes. You can experience these natural delicacies at Mary Ott's "Hot Off the Press" exhibit at Touchstone Gallery from July 3-28, 2013.